As a dog walker, occasional pet sitter, a responsible pet parent, and someone who hikes in the woods with her dogs, I get certified in pet first aid. This year, I got certified through one of the most comprehensive pet first aid classes there is – Walks n’ Wags First Aid. I was so happy that I did. Walks n’ Wags is from Canada but there are a few instructors certified in the US. Lucky me, a couple of those instructors are right here in Seattle. Metro Dog has several trained instructors and offers a class once a month in the Seattle/Bellevue area. Walks n’ Wags is one of the most complete pet first aid course available. The classes are intended for pet care professionals, dog and cat owners, rescue workers, groomers, and shelters. Course completion offers continuing education credits for IAABC, CBCC-KA and CPDT-KA members. The class has received the Animal Wellness Magazine Stamp of Approval and a Modern Dog Fave Find. 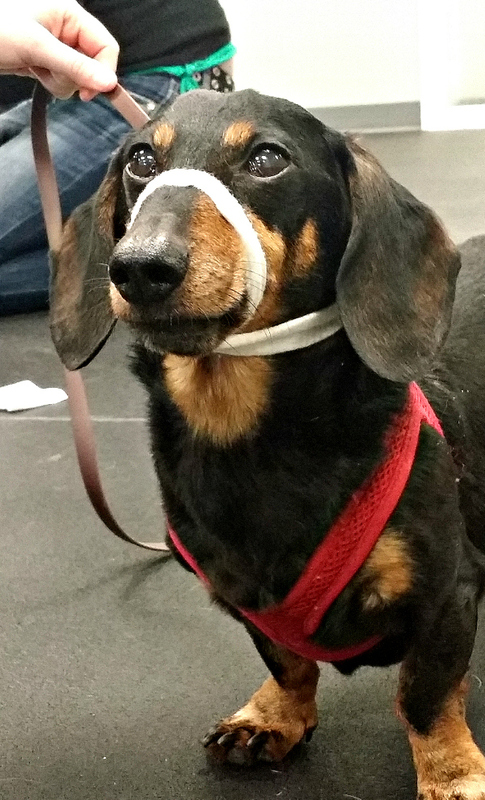 So why a pet first aid class? Well, to be honest, there are some things that you can learn in a human first aid class and apply to pets. For example, how to compress a wound to help stop bleeding or the concept of splinting a broken limb. However, there are many things that you can’t learn. Surprise! Dogs and cats have a different anatomy, vitals, and physical shape than humans. A dog’s resting heart rate is higher than a humans. Do you know what is normal? 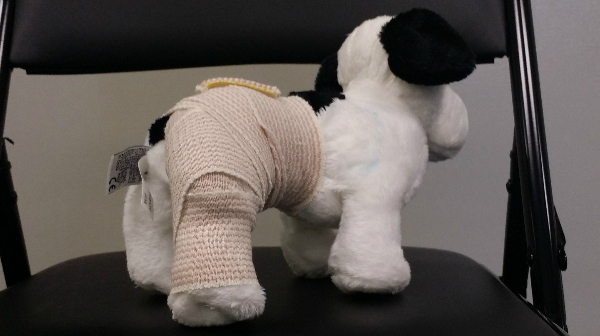 Do you know how to properly wrap a broken tail on a dog (it’s not what you might think)? Or how to give a dog CPR or perform the Heimlich maneuver if they are choking? You learn these things in a pet first aid class. Walks n’ Wags courses also include a strong emphasis on methods of preventing illness and injury. Participants work with live, wiggly pets to further develop their new skills! I really enjoyed my class taught through Metro Dog. The instructors were very patent, knew a lot about cats and dogs, and explained the course material clearly. I took my class all in one 10-hour day. They broke up the long hours nicely with “practice” breaks in between lecture modules. Because this unique course encourages practicing on live animals, I got to bring Chester with me as my guinea pig. He was quite the trooper. You can get more details on the classes, including how to sign up, here. If you are one of our Canadian friends and would like to get certified, check out the Walks n’ Wags class schedule here. This looks like a great class and I’ve been wanting to take one. I wish they were more available in the states. It looks like just Seattle and Vermont right now. I’ll maybe have to check into alternatives. What a great idea! I need to look around down here for something similar. 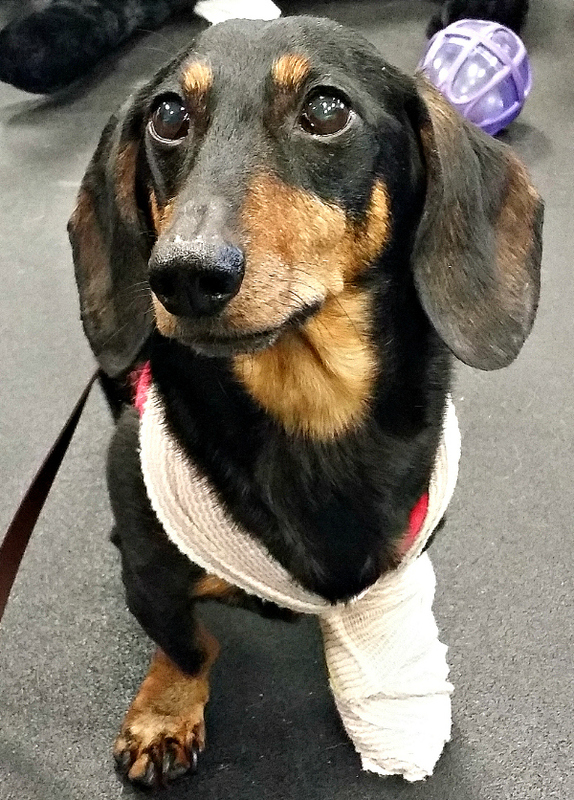 Chester looks so cute while sporting his cast! Yeah, any pet first aid class is better than none in my book. Hope a Walks N Wags class comes to where you are soon though. That’s fantastic! Thanks for the link, I’ll be checking into the online program. That’s pretty cool. I checked out their website and they actually offer a course in Vermont, which isn’t all that far from me. I think it would be worth the trip. This is a very good idea, especially for people who go hiking with their dogs, as they might be miles from help during an injury. Chester in that cast is so adorable! I am glad you are prepared before a summer of hiking. Thanks for sharing the info. That’s so great! I love how Chester lets you use him for first aid demo. My doggy won’t leg me do those things. She has a ‘six sense’ and run when I’m up to something, but will stay if I’m not trying to dress her up. How she knows I don’t really know.